Thanet Male Voice Choir was delighted to be able to present a cheque to the Richmond Fellowship for £3, 200 following their very successful sell-out Christmas Carol Concert at Holy Trinity Church in Broadstairs. From small beginnings 14 years ago, these annual charity concerts have now raised nearly £40, 000 for local good causes. Chairman of the Thanet Male Voice Choir, Paul Talbot, thanked everyone who had supported this year’s concert for their generosity, in particular the concert sponsors Terence Painter Properties. Special thanks were also due to the children from Upton Junior School Choir who made their customary guest appearance and to the Proteus Brass Ensemble who added a special Christmas touch to the proceedings. Thanet Male Voice Choir was delighted to be able to present a cheque to Help for Heroes for £1, 800 following their very successful November concert at St. George’s C of E Foundation School in Broadstairs. This total included several personal donations including one from a pensioner who was so touched by the evening that she gave her winter heating allowance to the cause. 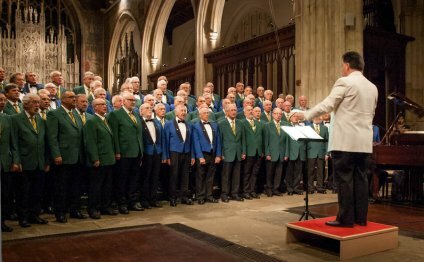 Chairman of the Thanet Male Voice Choir, Paul Talbot, thanked everyone who had supported the concert for their generosity, in particular the several Broadstairs traders who had sponsored the event. Special thanks were also due to the Principal, staff and pupils of St. George’s School for allowing the use of their excellent new school hall and for their co-operation in the organisation of the event both before and on the night. The guest performances from a bugler from the Princess of Wales’s Royal Regiment and the school choir, and the presence of the school cadets, added their own special touches to the evening. Thanet Male Voice Choir - "Bring Him Home".